The big day is finally here, Vrai Magazine is live! We have been working so hard working up to this day and it has definitely paid off, I know you guys are going to love this new site. When I was asked to join the team, I knew it was going to be great but I couldn’t have imagined just how beautifully the site was going to come together. I feel lucky to be a part of such an incredible team of bloggers… everyone is SO talented. These eggs are my first contribution to the site and you can get to know me even better in my next post for the magazine here! If you enjoy this blog then I know you’ll love what’s happening over at Vrai! We have a little bit of everything so you’ll be sure to find what you’re looking for and what I love most about it is the personal stories that go with each post. Not only will you get to learn how to do things but you’ll get the “why” behind everything. I am in love with these eggs, I still find it fun to decorate eggs each year even as an adult. 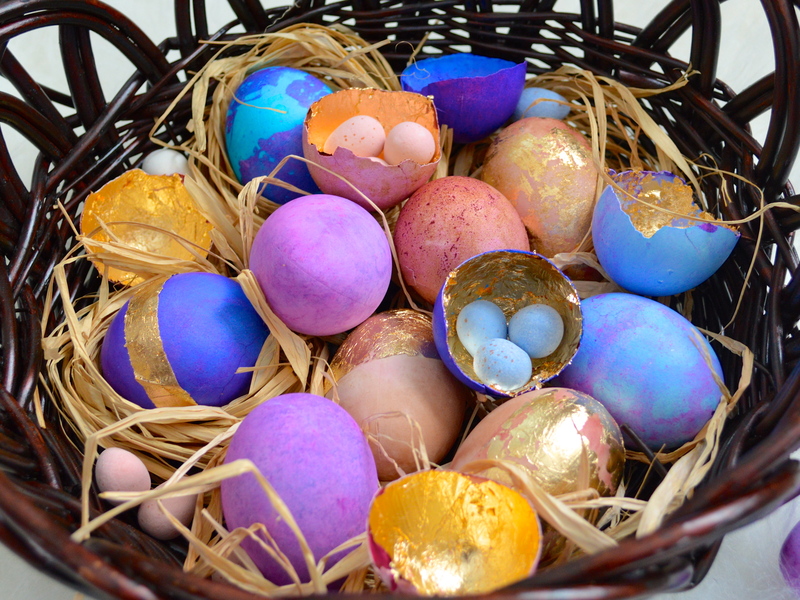 I think the gold leaf in these give a chic look to your every day easter egg. To get the step-by-step DIY for these Golf Leaf Easter Eggs, head on over to Vrai Magazine! If you like this craft, check out my marbleized Easter eggs or my etched Easter Eggs, and be sure to see all my Easter inspiration ideas! I love grown-up Easter egg decorating! These are gorgeous!! What a cute idea. The colours are beautiful. Thank you! I am so in love with the bright colors, it makes me feel like spring really is here! !